Newcastle United will take to the field on Wednesday in hope rather than expectation. The Magpies have won one of their last eight games, scoring just two goals. With Mathieu Debuchy added to an absentee list which includes Loic Remy (suspended), Fabricio Coloccini (knee), Cheick Tiote (hamstring), Yoan Gouffran (muscle) and Papiss Cisse (back), all does not bode well for the visit of Tottenham Hotspur. Manager Alan Pardew said: “I hope things go our way because with so many key players missing it’s a big game for us in terms of getting a result. After that we’re going to have a lot of our senior players back and it’s going to make a big difference to us. Debuchy injured his calf after falling badly during Newcastle’s 3-0 defeat at Stamford Bridge on Saturday. He tried to play on, but was substituted before half-time. Replacement Mapou Yanga-Mbiwa is the most likely candidate to deputise on Wednesday. Pardew (pictured below) is still hoping Cisse and Tiote can return for the game. He felt the loss of key players was compounded by individual mistakes, never more so than when Moussa Sissoko was clean through on goal at 1-0 and allowed Petr Cech to save. Chelsea broke from the corner to double their lead. 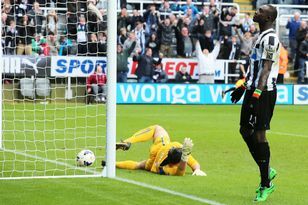 Pardew added: “We made two errors on that corner. “One was the corner itself, then Vurnon (Anita), bless his heart, had a big touch and from that moment on we were always struggling. Maybe having four or five big players missing had something to do with it. “In some ways playing us right now was good for Chelsea, a bit like when they went to Man City on Monday with four key players missing.